Charm jewelry continues to be one of the strongest fashion trends. We’re seeing this trend play out two ways. There are bead-style charms, such as those sold by Pandora or Trollz. There are traditional charms, designed to be added to a bracelet by means of a jump ring. Both styles have their fans – and if you’re a horse lover, you’ll love our gold horse charms! 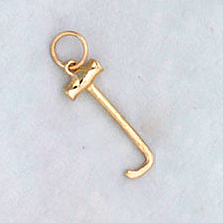 We love this Gold Boot Pull Charm. Talk about an equestrian essential – you can’t go out in the show ring without your boots on! Immediately identifiable by those ‘in the know’, this charm will make those with inquiring minds ask what it is – and is there anything more fun than talking about the time you spend with your horses? 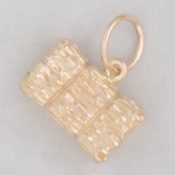 If you love horses, you’ll definitely recognize the 14K Gold Hay Bale Charm! Unlike regular hay, which this year seems to be priced as if it were actually made of gold, this charm is the real deal. Made in the USA by master craftsman, this is a detailed representation of the hay bales you encounter every single day. 1/2″ across and 5.2 grams, this is a cute and quirky addition to your equestrian-themed charm bracelet. Now for fans of the bead-style charm bracelet. There are lots and lots of beautiful bead charms out there, but very few designed for the horse lover. You know we couldn’t let that situation continue! That’s why we’ve become the exclusive source for equestrian-themed bead charms. One of our favorites is the 14K gold Pandora-style horse head charm. This is a horse head charm that actually looks like a horse! If you’ve been searching, you know how rare that it! Exquisitely detailed, this gold horse head charm adds the perfect touch of equestrian elegance to your Pandora-style bracelet. Also available in silver, if that’s your preference!